Six years ago this April, we bought our house and moved in by July. 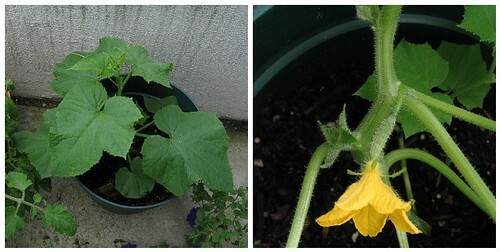 The following year, TechyDad wanted to start planting flowers and possibly some vegetables. Over the years, he and our oldest son, NHL, have attempted growing many different items. Each year, our biggest nemesis has been the neighborhood "wild" bunny family. These furry pests have destroyed many items over the years. After the first attempt at putting them into the ground did not work, the boys tried to put them into pots that were off the ground. This did better, but there were still problems. Last year, our plants were in large pots on our front patio. Finally, we had items that were successful. We had a bumper crop if jalapeno peppers, a lot of mint, several cucumbers and a handful of tomatoes. With Earth Day coming next week, we will probably try to plant some items this coming weekend. Our 2010 home farm will likely be grown inside our covered porch. This will allow it to have plenty of light, but protect our plants from bunnies, birds and hail. During the Spring and Summer, we always support our local Farmers Market and love the local and fresh produce. Still, there is just something extra delicious about items picked from our own garden. In addition to the savings, our children have also learned valuable science and life lessons from growing our own plants and vegetables. 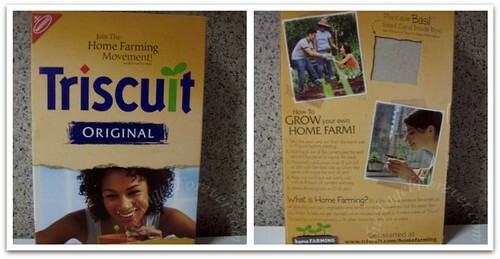 Thanks to Mom Central, I recently found out about a Home Farming campaign that Triscuit is working on. I received one of the four million boxes of specially marked Triscuit boxes that contains seeds to help start our own Home Farm. In an attempt to help Americans celebrate the values of simple goodness found on farms and encourage the growing of fresh herbs and vegetables at home no matter where you live, Triscuit has launched the Home Farming Movement in collaboration with the non-profit organization Urban Framing. Together, Triscuit and Urban Farming plan to create 50 community-based home farms across the country in 2010 in order to connect communities through growing food together. To help get this fantastic program off the ground, Triscuit is putting plantable herbs seed cards in four million boxes of Triscuit crackers to be grown on home farms in backyards and balconies. With Earth Day right around the corner, this spring proves ideal for incorporating home growing values into your family’s life. Head to the Triscuit Home Farming Movement Web site, www.triscuit.com/homefarming, for more information on how you can start your own home farm or get involved in the Movement. So will you be joining in on the Home Farming movement this year? If you are what do you hope to plant this year in your garden? I know that we will be planting the basil that was included on our Triscuit box along with tomatoes, cucumbers, zucchini and other items that we find. With any luck we will have more nutritious and delicious items to eat right after we pick them. Happy planting! Disclosure: I wrote this review while participating in a blog tour campaign by Mom Central on behalf of Trisciut and receive the product necessary to facilitate my candid review. In addition, I received a gift card to thank me for taking the time to participate. I really wish we could do a garden this year, but with our impending move we have no idea where we will be for planting or harvesting, so this year we are out. The Triscuit box sounds awesome! Great idea. I would love to farm but nothing ever really takes in my back yard. And anything that does the rabbits eat. Plus, my soil is very rich with cadmium so I can only do pot planting and I am still working on getting a handle on that. .-= Upstatemomof3´s last blog ..Popsicles!!! =-.